ATG Electronics eLucentâ„¢ DL Series LED Downlights are energy-efficient LED recessed retrofits designed to replace conventional halogen and compact fluorescent CFL lights. They are widely used in hospitality, as well as in commercial, and residential locales. 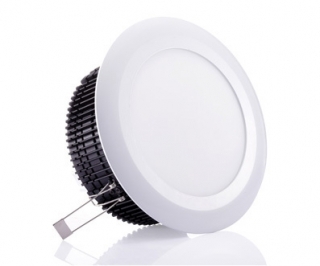 eLucentâ„¢ DL Downlights achieve a superlative luminous efficacy of 75lm/W through the utilization of ultra bright SMD LEDs and reflective materials innovated by Japanese companies. Using the current design, junction temperature also remains excellent, at under 50 centigrade thanks to a highly effective heat sink design. With piano style paint work and frosted anti-glare lenses, eLucentâ„¢ DL Downlights project an elegant air, while providing light that is comfortable to the eyes. They can ONLY be used for dry wall installation with spring-loaded clips and do not fit into recessed cans.